It's that time again, The Royal Food Joust entry time. We always seem to be scrambling come the deadline for our Joust entry. It's our fault, of course, for being so indecisive. Not only do we start late, but we throw out ideas and keep discussing them and discussing them and discussing them. . . the next thing we know it's time to send in something and we still haven't decided. This month's Joust ingredients: fennel, dairy, and parsley. We agreed on keeping it simple and just wanted to let the fennel be the main ingredient. In a pot, we rendered some bacon until crispy, adding some fennel seeds in the process. It was really nice to have crisp bacon with fennel seeds on them. We took the bacon out of the pan and set it aside. Then, it's a straight dump-into-a-pot operation. We rough-chopped a couple of fennel bulbs (including the stalky parts) and put it in the pot with rendered bacon fat. We let it sweat for a couple of minutes, then added a glug of white wine. After a couple more minutes, we added water about 1/3 or halfway up the pot. 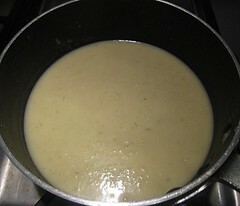 We brought the mixture to a boil, covered the pot, and let the mixture simmer until the fennel was very tender. I buzzed the mixture in the pot until well-blended. Then (so very unlike us), I strained the mixture. I put the smooth liquid back into the pot. At this stage, we added the heavy cream. It was also at this time that we added our secret ingredient: roasted garlic! Just a little bit, maybe 1 or 2 cloves. This is completely optional, of course, but it does add depth and a little something-something to the soup. I whisked the mixture until smooth, adjusting the seasoning (salt and pepper). The black pepper is very important to the taste of the soup. For us, anyway. But, if you prefer not to have black specks in the white soup, that's fine as well. But wait! Where's the parsley? At first, we were thinking of adding the parsley right into the soup. But then, I wanted the soup to be pure and very pale. So, we made parsley oil. I blended some parsley with a little olive oil then strained the mixture. I also added salt into the mix. 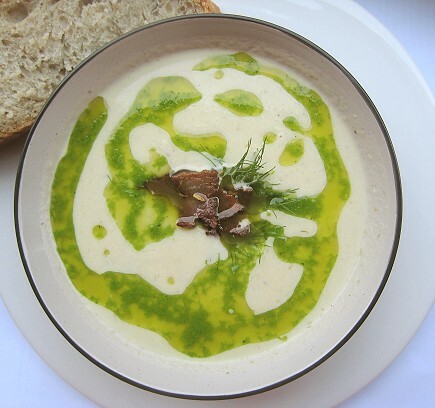 To serve, ladle the soup into a bowl, add a generous amount of parsley oil and garnish with crispy fennel-y bacon and some fennel fronds. We had some homemade limpa bread -- a Swedish bread flavored with, among other things, fennel seeds -- and served that alongside. Any good, crusty bread would do, and this makes a nice lunch or a light supper. This is a very comforting dish, very creamy and very soothing, the anise-y mildness of the fennel bulbs supported by the subtle depth and body of the roasted garlic. 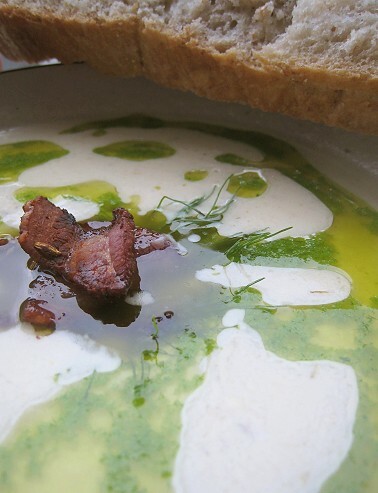 There is also a wonderful contrast in textures and flavors: creamy soup vs. crispy bacon and whole fennel seeds, mild round flavor vs. salty bacon and bright, sprightly bite of the fennel seeds. The parsley oil is not merely for "garnish." 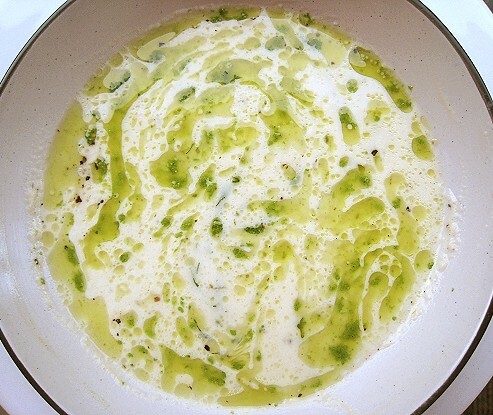 A good dose of it is needed to add a fresh, verdant flavour to the smooth creaminess. The soup is pretty even after it's all mixed up. Look at its marbly pattern! 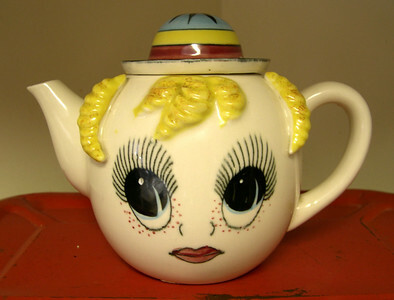 Boil some water in a small pot. When boiling, add chopped parsley and blanch for a few seconds. 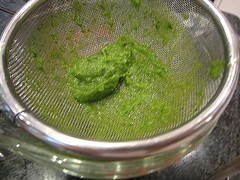 Drain and add blanched parsley to blender. Add olive oil and blend very well. Strain the mixture through a fine sieve (or line a sieve with a coffee filter). Set aside. In a pot or saucepan, turn heat to medium and add bacon slices and fennel seeds. Stir occasionally until the bacon renders its fat and turns crispy. 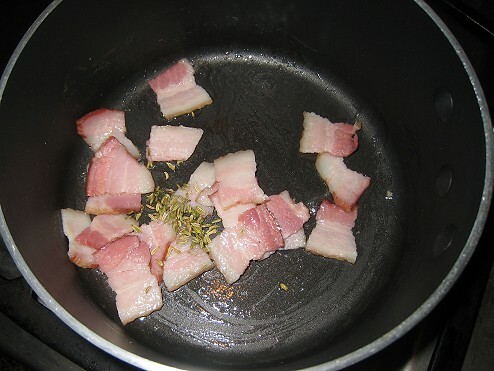 Take bacon pieces and fennel seeds out of the pot. Set aside. Heat the bacon fat and add the chopped fennel bulbs. Sweat for a couple of minutes; do not brown. Turn heat to high and add white wine. Let the alcohol evaporate (a couple of minutes), then add the water. The water should be about 1/3 up the pot. Do not add too much water. Let the mixture boil, then cover the pot and turn the heat to low. 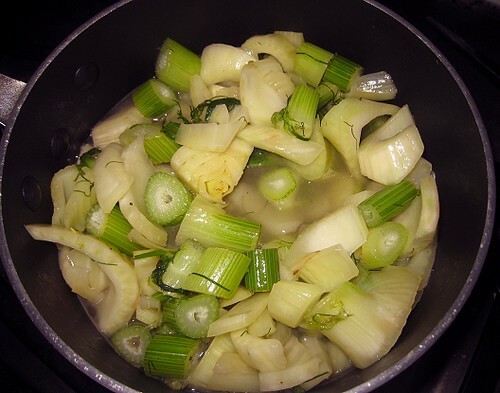 Simmer until fennel is very tender, anywhere from 15 to 30 minutes. When fennel is tender, puree using an immersion blender. (Or transfer contents to a blender and puree.) 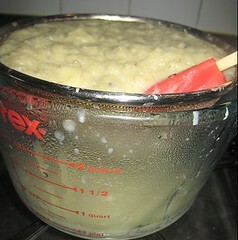 Strain the mixture and add the strained liquid back into the pot, over medium-low heat. Add roasted garlic (if using), heavy cream, salt and pepper. Stir until smooth. Adjust the seasoning and consistency of the soup as you like. Ladle soup into bowls. Add generous amount of parsley oil in each, and divide bacon among the bowls. Garnish with fennel fronds if desired and serve with crusty bread. wow!! you guys are really challenging! !.Look good with the marbel effect! I like the effect of parsley oil on the soup, absolutely. A piece of art! Oh what a great idea for a soup! & I agree the bacon is the most important part, bring on the pork! This looks amazing. I've never made (or had) fennel soup! This looks awesome! At first I thought it would be very fennel-y with the seeds and the bulbs, but with the roasted garlic and parsley oil it looks and sounds tasty! Good luck with the Joust. That is one of the prettiest soups I have ever seen! This soup is creative and easy on the eye. I've grown to like fennel and through the Joust. I cracked up at the part 'So unlike us' when you strained the pulp. I am that way too, mostly because it's a pain washing strainer. 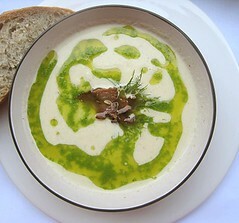 Other than that, fennel soup with parsley..yum! That is a wonderful sounding soup. I love garnishing soups with flavored oils, those I'm usually too lazy. 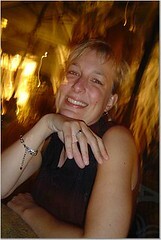 At first I thought we were done w/ the picture-taking, then when I was eating I noticed the marble effect! Haha. We don't cook much with dairy (milk, cream, etc), and we don't really cook/make things with fennel either. So it was a challenge! Actually, neither have we until this one. The fennel really has a mild flavor when cooked like this. We added a tad more roasted garlic (just because we're garlicky like that), but the parsley oil and BLACK PEPPER made it for me. How absolutely beautiful! Wow, I can only imagine how good this is! Great presentation! I really like the colours. You two rock so much. It always amazes me, that as a team, you two can create such beautiful, tasty dishes. It's really the team thing that astounds me. Oh my, you have my vote for this month's Joust with this entry. :) The roasted garlic was a particularly nice touch. Thank you. gotta say, that parsley oil was a stroke of genius! on that alone, you should win! That is a striking picture. I like that you garnished with some fennel too. Could you have done a fennel oil instead of parsley, or would that have been fennel overload? Thanks you! =D We had some roasted garlic lying around and it was a spontaneous thing. Thanks -- We didn't think want to ruin the whiteness fo the soup, so the parsley had nowhere to go except into an oil! Oh, re fennel oil -- We didn't even think about it, just because we had to use parlsey in some form for the dish! This looks just wonderful and I was just thinking the other day how I don't ever cook with fennel. Now I have a reason, thanks! wow, the soup looks stunning, absolutely stunning. I'll confess, I was completely intimidated by the joust ingredients. You did a great job! How about adding a bit of shaved orange zest on top when serving? Fennel and orange are great together.